Been with Smarty for 4 months now and cannot fault them, great signal and easy to see my usage. Been with Smarty around 8 months now. I came from a contract with EE that was £50 a month. I'm now paying £15 for the same deal and my signal has never been better. Recommended! Really pleased after changing to Smarty. I get great coverage and the price for the package at £7.50 pm is fantastic. "Fantastic! Everything I wanted for a cheaper price"
It's a great price and they give you money off the next month if you don't use all your data. Smarty has saved me so much money! They have lovely customer service too. Transferred my number to Smarty after being with EE for years paying £50 a month. Simple, smooth process. Hated the fact needed to take a 12 month contract out to get good value deals elsewhere so stumbling on Smarty's excellent packages was a god send. I also like the fact will refund unused data the following month. I highly recommend it so far. Signal has been fine. Best network I have ever been on, period. I have never had to pay a bill for a few months now as I've referred lots of my friends. So am really happy with Smarty thus far and customer service has been good. Great deal. Fast Service and Delivery. Smarty has saved me so much money, just wish they had an app for checking usage and balance instead of having to use the website. "Simple SIM Contract from Smarty – Love it!" What a cool way for mobile phone deal. I've got data if I need it but I don't pay for it if I don't use it. Absolutely brilliant idea. The support staff were extremely helpful when I needed advice. At first I thought this is too good to be true, but they deliver what they promise. Please keep it up and don't get too big! So far so good. Ordered sim, it came the next day. Requested to take my number over to Smarty, nice and easy, completed last week, only took two working days. Had a couple of questions and the guys on the online chat were very helpful. Signal has been fine, faster speeds on the internet than my previous network, easy to use the dashboard to see what you've used. They also do a thing where they take money off your bill each month for any unused data. They have also just set up EU roaming, so there's no extra costs, just comes out of your monthly balance. So that's an added bonus. So time will tell but impressed so far. Another thing they do is a friend referral scheme, for every friend you recommend, if they sign up, you get a free month and so do they! "Really wonderful to get our unused data as a credit back"
Really wonderful to get our unused data as a credit back from SMARTY moreover this SIM-only stuff suits my needs. I am really satisfied being a regular user now of SMARTY. It's great! Unlimited texts and minutes and data for that price! My first month with Smarty was absolutely top notch. I use my phone daily and cannot fault the service. The reception which piggybacks off the 3 is great in my area and way better than giffgaff. I just hope SMARTY can continue to deliver great value for many years to come without adjusting the size of current plans and prices. "Quality service so far from Smarty"
Joined Smarty as a bit of a stab in the dark as they were new. But it was a quick and simple setup. My SIM was activated in minutes and my old ported number over in 2 days. All this was done online which I love as I hate having to ring up for such simple tasks. Decent coverage too, I get 4G most places but 3G at times inside. I will definitely keep using them if service continues as is and they keep giving me discounts for unused data on quiet months. Smarty is a low-cost mobile service provider owned and operated by Three. Though your contract will be with Smarty, the provider uses Three’s mobile infrastructure to provide service. Smarty are best known for the simplicity of their plans, their data buyback programme, and their low prices, making them a solid budget choice. Because Smarty uses Three’s network to provide service you can expect the same coverage as Three’s regular customers receive. Currently, that means 97% coverage for both 3G and 4G. Three (and therefore Smarty) do NOT support 2G service, but this shouldn’t be a problem unless you have a very old phone. It’s always best to double check your local area using the coverage map on Smarty’s website to ensure that you’ll get good reception wherever you are! In basic terms, Smarty charges you £5 for unlimited calling and texting, and then £1.25 for each GB of mobile data. You cannot use a Smarty SIM card as a traditional pay as you go SIM. However, you can top up credit (either £5, £10, or £15) and use it to pay for things that are not included in your package such as international calling (between 3p and £2 a minute depending on where you’re calling), calling special rate numbers (3p per minute plus the service charge of the number you’re calling), or buying additional data (£1.25 per GB). Notice that there are no big data plans with Smarty. If you want more than 8 GB of data per month, you’ll need to buy extra GB, and these costs can add up quickly. Plans with Smarty expire automatically (and renew automatically unless you change them) after 30 days. Any additional top-up credit does not expire at all. But you must have a valid 30-day plan before you can use any additional top up credit. 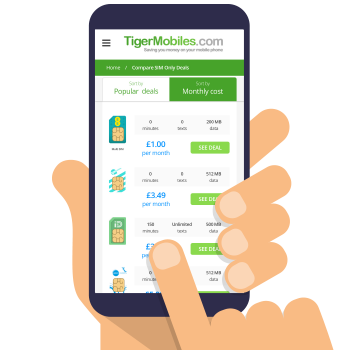 Looking for the best PAYG SIM’s with no expiry? Read our pay as you go guide. At the end of any 30 day period, Smarty will credit your account for any data left unused on your chosen plan. You’ll be credited with £1.25 per GB of data (calculated in 1 mb increments), meaning you’ll never pay for data you don’t use. This also means that it could be a good idea to choose the biggest plan available since you’ll receive a refund for unused data anyway. If you refer a friend to Smarty you’ll get the price of one month of your regular plan credited to your account, and your friend will get their first month free. A basic comparison to other networks shows that Smarty’s prices aren’t necessarily the lowest around. In most cases, other providers will give you more data. For example, with Smarty’s £7.50 plan you get 2 GB of data, but iD Mobile will give you 2.5 GB of data for just £7. You only get 4 GB of data with Smarty’s £10 plan, but the same fee will get you 9 GB from iD Mobile or 6 GB from Vodafone. £15 buys you 8 GB of data with Smarty, but 12 GB with Three, or 10 Gb with iD Mobile. However, this doesn’t take into account that data buyback programme. Whilst with other networks you pay for that monthly limit no matter how much data you use, with Smarty, you get money back if you don’t use all your data. If you’re not a big data user, or if you use varying amounts of data each month (making choosing a good plan difficult) then you could save money with Smarty simply because you won’t be paying for what you don’t use. Smarty is a SIM only operator, so you won’t be able to buy a phone with them or through a Smarty contract. You’ll need your own, unlocked mobile phone, and Smarty will provide you with a free SIM card. Smarty does not support WiFi calling, so you’ll need a regular mobile reception to make calls. They also do not support any free WiFi hotspots (unlike some other operators), so you’ll need to use your mobile data whilst out of the house, or rely on WiFi from cafes and restaurants. Smarty does allow mobile tethering. If you want to use your mobile data to get your tablet or another device online you can do so without fear. Just watch that data use, since tethering can use up mobile data limits quite quickly. If choosing a mobile plan is tough for you because you never know how much data to go for, then Smarty could be a good choice, since you get credit back for unused data. Big data users, or those who regularly use the same amount of data each month, will probably find other networks cheaper than Smarty, however. But the pure flexibility of using Smarty with their 30-day contracts and data buyback programme mean that they could be a very convenient choice for many people.